Running is one of the most natural things we can do as humans. Think back of when you were a child and you had tons of speace laid out in front of you. What is your first instinct? To just run. To fly through the grass and feel the wind in your hair and on your face. Even though running is a natural act that our body urges us to do, there are many people that are injured by running the wrong way. 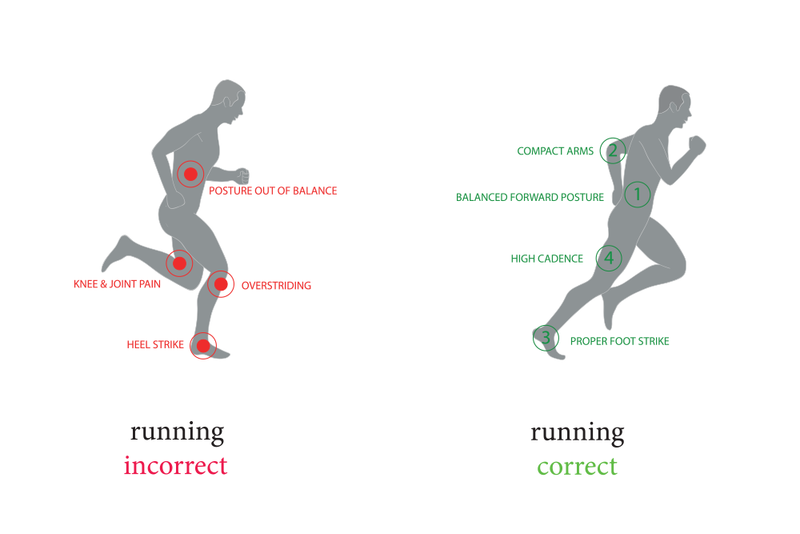 That’s why being aware of your stride and how your feet fall on the ground is so important to those who run frequently. Running, like many aspects of exercise, has a science to it that is important to know if you partake in the activity. Whatever your favorite form of exercise is, it is good to know the inner workings of what exercise does to your body. When I went through my first pose method certification I was astounded by a statistic shared with our group. The average vertical oscillation (bounce between steps) is 4 inches for an experienced American marathoner. Whereas the Kenyan runners had next to zero. although 4 inches does not sound like a lot over a full marathon the runner climbs over 3 miles. So you can see a huge loss of energy and I'll put if you are climbing with every step of your run. Once you have a basic understanding of how exercise affects the body, you can start building up to your running style. One of the more popular methods runners use is the Pose Method. This method helps prevent injury as well as increase strength. Read on for more information on the Pose Method. The Pose Method of Running is exactly how it sounds: running through poses. It takes a look at all the different ways the body can move (and there are a lot) and applies it to running form. While the Pose Method can be applied in any type of human movement, it is especially helpful when it comes to running. The Pose Method was created in 1977, after studies on the performance of the Kenyan runner revealed the efficiency of their stride. The Pose Method for Running is just one of the many methods offered. It is also the most-used method, as a result of how popular running has gotten over the years. With running and everyday life, your posture is one of the most important elements that determines success and performance. It is necessary to have good posture not just for performance, but for your health as well. Improve your posture and create a solid base for your running. There are many reasons why people get injured while running. It could be that they did not warm up and stretch properly before embarking in running activity. It could also be a result of going too hard too fast or too far too quickly when it comes to the actual act of running. For many people, they could just have weak muscles that get extra strained as a result of running. Whatever the cause, injury happens quite frequently in the sport of running. The first aspect of the Pose Method of Running is technique, which is the base of good running. The key elements to the method: pose, fall and pull. The focus with these elements is gravity and using it to your advantage. Instead of fighting gravitational pull, you are using your body to work with it. Pose, the first of the elements, refers to the runner’s Figure 4-stance (the name comes from what the runner looks like when running — for example, the lifted leg behind the body forms a number 4). This shape helps to align shoulders, hips and ankles with the supporting leg. Using the ball of their foot, the runner switches to the other foot while letting gravity do the work. The support foot is pulled from the ground, which allows the body to go forward. The other foot falls freely, as it changes positions (which refers to turn over) with the support foot. The result of this form is less energy expended on running, which means more energy is saved for increased endurance and speed. In addition to a better performance, the Pose Method of Running also reduces impact on your knees by at least 50 percent, as well as minimizes vertical oscillation. If you are interested in incorporating the Pose Method of Running into your running style, there are a few things that you need to be conscious of when you are running. The first and most important is maintaining that figure 4. Keep your knees bent slightly and lean forward slightly from the ankle (not the hip) , in order to maintain this position. When you run, be sure to pull your legs up under the hip, instead of pulling them up under the buttocks. Complete the method with the ball of your foot landing underneath the body. Like all new things incorporated into your life, the Pose Method of Running is going to take practice. Set aside a little time each day to focus on your running technique. Run smaller lengths and focus on your stride and style. The more you are able to practice getting these good, quality miles in, the more your body will start to adapt to this running method. Once you feel that your body is properly adapted to the running method, you can go further distances while maintaining your technique. The Pose Method of Running is just one way to become a stronger, faster and healthier runner. Your overall running performance, however, is one that is diverse and should be rounded out with cross training, nourishment and overall body wellness. There are many aspects of your lifestyle you can tweak and change that will help improve your performance as a runner. Here are a few examples of exercises and foods to incorporate into your life that will improve your health and wellness. Plyometrics is also referred to as jump training, as a result of how much you bounce around doing these exercises. The goal of plyometrics is to move the muscle from exertion to contraction in a rapid way. These exercises help strengthen leg muscles and get them to react quicker, which can help out with running speed and strength. In addition to your normal running routine, plyometric exercises can help target and work different muscle groups in your legs that may not get the same kind of workout by just doing running. Whether you are looking to lose weight or not, your diet is an important part to your running performance. By being mindful of what you put into your body, you will be able to give your body the nutrients it needs to be able to perform at its peak. In this instance, ‘diet’ is not about losing weight, but more about creating a healthy lifestyle for yourself. There’s a reason why you feel sluggish after eating fast food and more energized after eating fresh fruits and vegetables. This is the perfect example of why diet affects performance. Long distance runners can eat Big Macs without gaining weight, but if they want to win races, they need to reevaluate their diet. Luckily, there are many different diets out there that can fit your lifestyle and fitness needs. Many people swear by Paleo, Zone, Vegetarian, Vegan and may others (I love the options with BACON!) It really depends on what you think is right for you. The main point, however, is that you are providing your body with an ample supply of nutrients through fresh foods. I suggest tracking what you eat, training, hydration, and rest to see what is yielding the best results. If you have question or would like help with any of this subject matter please Contact me.